David is one hyperactive, bubbly child. When asked what he wants to be when he grows up you will usually hear a string of 'doctor, teacher, footballer, driver...' He is always smiling and playing with anything and everything he can get his hands on. But behind the smiles he is a child who has experienced too much too soon. 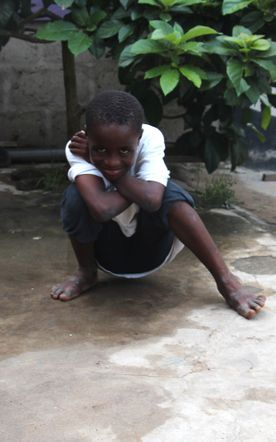 He was brought to the orphanage with his twin brother Daniel under tragic circumstances. When the boys were just three years old their mother went clinically insane. She can be found wandering the streets of Kanteakwa village and does not know who she is or anything about her past. The father re-married shortly after leaving the mother and had another three children in addition to the step-mother's child from her own previous marriage. It was clear from the start that the step-mother held an unusually strong resentment towards the twins to the point were she hated them. She never took care of them, wanted them around or would even look at them. If the father were to give something to the twins, she would take it away and give it to her own children instead. She fed her own while leaving the boys to beg on the street. The boy's made friends with a rice maker down the street and she would feed them rice each morning. The stepmother brought her four children to go to Patrick's school. She did not want the twins to have an education so they were left alone during the day. One day, a few months after the four children started school, the twins were brought along. The mother gave Mama Pat money to buy cookies for her four and specifically told her not to give any to David or Daniel. Mama Pat watched as the other four shared the cookie with the twins when their mother was not looking and noticing they all had the same last name she started to question the situation. They found out from the rice lady and a friend in the police about how the boys were being treated and Patrick asked the father to bring the children to the orphanage so he could care for them and give them an education. They started coming to school with the other children but would arrive late each day. The step-mother would only bathe and dress her own and then the twins were left to fend for themselves, but only after the others were done. Three months later, the father brought David and Daniel to live at the orphanage. The wife was unaware as he knew she would not approve of them being given a good life. The first week was euphoric for them both. They had their first very own box of juice. They sipped at them for two hours, cherishing every last drop and then kept the boxes for weeks. They also had their first egg each. Both boys went to the water to scrub their hands clean before even touching the egg and then savored each bite. A while after, a lady brought a closed Tupperware container of beans and rice to the school and asked a boy to deliver it to David and Daniel. The boy gave it to a teacher who placed it on a shelf and forgot about it. Later that day, the boy told Patrick about the lady and when Patrick asked the boy to describe the woman he immediately recognized her as the step-mother. He knew it was too out of character for the woman and alarm bells started ringing. He went straight for the shelf and seized the container. Luckily no one had touched it, it had been poisoned. He threw it away and the boys never found out.